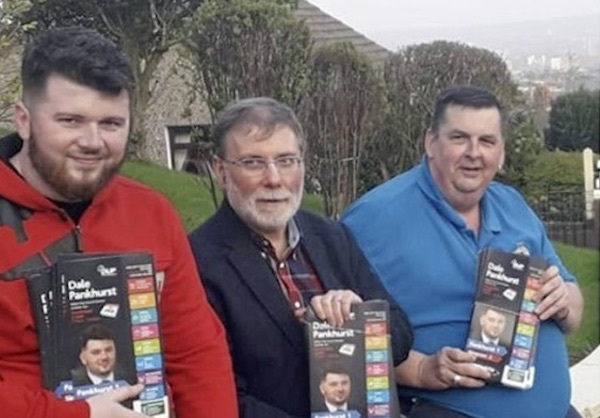 DUP north Belfast councillor Dale Pankhurst (pictured, left) and former Stormont minister Nelson McCausland (centre) have been canvassing alongside Mark Officer (right), who was jailed in 2015 over a cocaine haul worth nearly £1m. The loyalist kingpin was handed a 40-month sentence for being involved in the supply of the Class A drug. His name is also listed among those who signed nomination papers for Gillian Simpson, a DUP candidate in north Belfast alongside Pankhurst. Mr Pankhurst’s own nomination papers were signed by notorious Orangeman John Aughey. He was jailed for one year after violently mowing his car into nationalists at the Ardoyne shopfronts in July 2015 during a protest over the Orange Order’s bid to march past the sectarian flashpoint. One teenager became trapped under his vehicle, was run over and was dragged along, suffering life-changing injuries. Other unionist candidates have made headlines for different reasons. The election posters of far-right loyalist Jolene Bunting have been reported to the PSNI as potential hate crimes. The independent councillor, who is seeking re-election next month, put up campaign posters with slogans including “Put veterans before immigrants” and “Local homes for local people”. Sinn Féin councillor Ciaran Beattie described the posters as the “politics of hate”, while Alliance representative Micky Murray said they were “blatant, everyday racism”. Another independent unionist councillor, Henry Reilly, formerly of UKIP, had his account closed by Twitter after he issued a sectarian screed on the social network. The Newry, Mourne and Down representative told Twitter users that “Ulster Protestants will fight hard” in any upcoming war in the north of Ireland. Reilly declared: “IRA-types telling me the Prods are finished - I would remind the Provos that there is now no British Army or RUC here to protect them - Any war they start will be with Ulster Protestants alone and it will be a fight to the last and Ulster Protestants will fight hard”.